We all remember Pinocchio for the dreamy opening music, ‘When You Wish Upon a Star,’ which became the theme song for the entire Disney Empire. But the rest of the film is a surprisingly terrifying experience, at least for parents. Looking back on the Disney animated version, the story goes like this: a humble and lonely Italian puppeteer, Geppetto, makes a wish upon the first star he sees in the sky, to have his newly created wooden stringed puppet turned into a real boy. Overnight, the blue fairy comes down and grants Geppetto his wish. 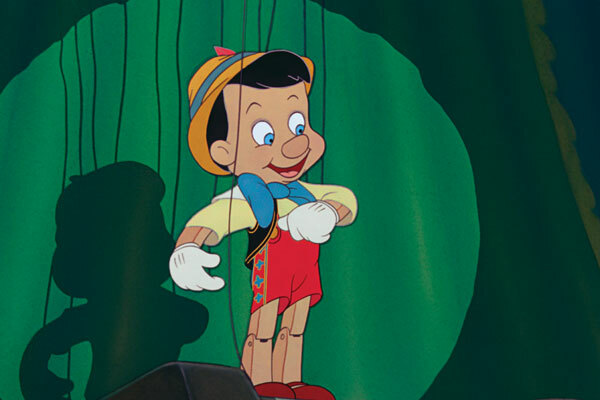 Pinocchio comes to life, though he is still made of wood and without the ability to grow like a real human. Though startled, Geppetto accepts the boy puppet as his son and sends him off to school – alone! Pinocchio never even makes it to the school, as he’s intercepted by a nefarious moustache-twirling con artist Fox who tricks him into joining the circus. In reality, the Fox takes a large sum of money from the even more maniacal circus wrangler, Stromboli, in exchange for Pinocchio’s indentured servitude. Hell, Pinocchio even gets locked up in a birdcage as a form of punishment for trying to go home. Pinocchio’s best friend and the embodiment of his ‘conscience’, Jiminy Cricket, saves the day and rescues the boy. But they both soon find out that Geppetto has been swallowed by a whale during his search for Pinocchio. The journey climaxes in the mouth of the whale and a dramatic escape literally from the jaws of death. As a parent who is about to send his year-and-a-half old son to daycare for the first time, Pinocchio may not have been the best movie to watch. Under Walt Disney’s careful eye, he’s sure to inject all of the thought-provoking moralistic themes of life and death, good and evil. Few ‘cartoons’ had a more palpable and visceral sense of danger or threat on their characters. Pinocchio is the embodiment of innocence. He’s as naive and inexperienced in life as a newborn child, and so Geppetto’s, and to some degree Jiminy Cricket’s, irresponsibility with Pinocchio’s care is the most grievous act in the film. Both characters let the innocent boy out into the world without any care whatsoever. Pinocchio’s journey into the seedy underworld of life is wholly traumatic. Stromboli’s gruesome circus prison is dark and disturbing, but the mysterious Pleasure Island, which is cause for nightmares for both adults and children, is downright delirious. After a brief escape, Pinocchio is coaxed back by the Fox to a grotesque amusement park of carnality and debaucherous behaviour. We can’t help but think of what kind of abusive metaphors are at play in this sequence. Sure, we see Pinocchio pressured into gambling, smoking, drinking and engaging in destructive behaviour, but it’s when Pinocchio and the children start sprouting big ears and tails and turning into donkeys that the film starts to warp into a surreptitious drug trip metaphor. The Coachman: How would you blokes like to make some real money? The Coachman: I'm collecting stupid little boys. The Coachman: You know, the disobedient ones who play hooky from school. The Coachman: And you see...I takes 'em to Pleasure Island. The Coachman: No, no. There is no risk. They never come back... as BOYS.